Remembering Donald Byrd, Jazz Trumpeter Who Spanned Generations : A Blog Supreme After he helped to develop the bluesy, driving hard bop style in the '50s and '60s, his funkier commercial hit recordings shaped black pop music through the advent of hip-hop. A committed music educator, the Detroit native was 80 when he died last week. Donald Byrd onstage, in an image circulated by his record label at the time, Blue Note Records. 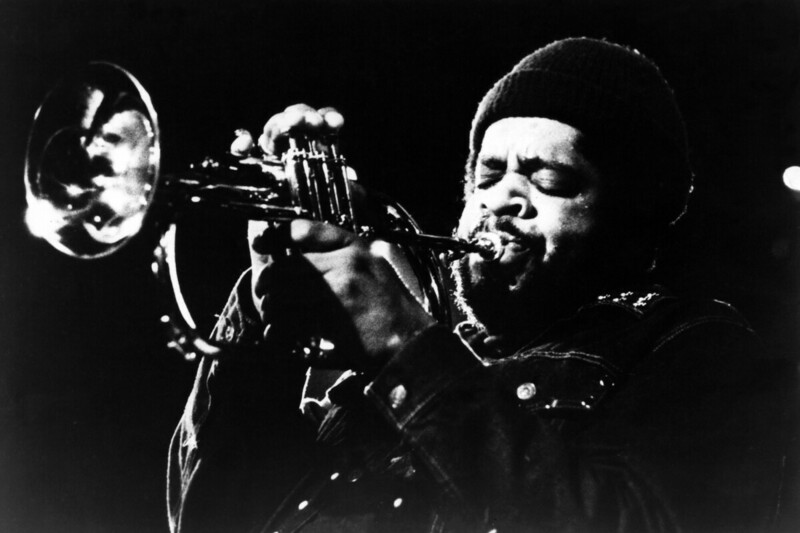 The trumpeter and educator Donald Byrd, a top jazz practitioner in the '50s and '60s whose later work shaped black pop music through multiple generations, died Feb. 4 in Dover, Del. Haley Funeral Directors near Detroit confirmed the news, which was first circulated online last week. He was 80. Donaldson Toussaint L'Ouverture Byrd played music based on bebop in the '50s — in New York and in Europe — then funk-fusion and R&B in the '70s, and wound up at the top of the charts. Soon after that, his music found its way into hip-hop. But no matter what style he was playing, Byrd was a teacher. Born in Detroit, he attended Cass Technical High School. For jazz, Cass Tech has proved to be an incubator of talent: Alice Coltrane, Paul Chambers and Ron Carter went there, among many others. From other area high schools, and public universities like Wayne State, the Motor City was turning out exceptional musicians in the '40s and '50s. "Oh, there's a million of 'em," says the saxophonist Lou Donaldson, 86. "Barry Harris, Tommy Flanagan, Elvin Jones, Hank Jones, Thad Jones, Yusef Lateef. Byrd came with what we call the Detroit clan ... and he had that Detroit flavor to his playing." Donaldson is not from Detroit, but he did meet Byrd later, after they both played in military bands and moved to New York City. "I was playing at Minton's Playhouse and he came by with his horn," Donaldson says. "To me he sounded great, like Fats Navarro and Clifford Brown. ... We became friends, we got a group together and we played at the Café Bohemia." Donald Byrd played on more than 50 albums in that time, some with Lou Donaldson, and some of them with luminaries like John Coltrane, Horace Silver, Thelonious Monk, Art Blakey and Max Roach. Donaldson says they were all playing bebop, after the innovations of Charlie Parker and Dizzy Gillespie had turned jazz upside down. In particular, Byrd was at the center of a variant known as hard bop, which added rhythmic intensity and dialed up the blues. "He was a very lyrical player, a very economical player, a very thoughtful player," says Nicholas Payton, a contemporary trumpet player. "He was one of the real melody-makers at that time. A real thoughtful, introspective player with a very beautiful sound." And Byrd was still in school while he was tearing up the New York scene. He got his master's degree in music education from the Manhattan School of Music and studied in France. He got a doctorate from Columbia University's Teachers College and a law degree. Nicholas Payton says Byrd told him black musicians needed to be in academia. "Someone needs to be able to lay things out in such a way so that we establish and have a voice in those circles," Payton says. "That was a big part in why he sought out that part of his education, and why he had a heavy presence in historically black colleges." Payton says that in the early '60s, Byrd was also worried that jazz was losing touch with the black community — that it was being co-opted by the mainstream. In 1963, he released a recording called A New Perspective, featuring a gospel choir and a song called "Cristo Redentor." "That album put him on the map," said trumpeter Marcus Belgrave, 76. "It spoke to the black culture and the church, the home, and it spoke to the whole black aesthetic and all those beautiful voices. ... That became everybody's favorite." Belgrave says that Byrd continued to work in education after he had a hit on his hands. "It's a passion that you have for your craft," Belgrade says. "It's more important than a little money. Didn't have anything to do with that. Has to do with what was in his heart — and what's in his heart is this music. And this music needs to be promulgated." Jazz relies on an oral tradition: Musicians learn from their elders and play in bands with their students. Byrd wanted to help create curricula that built on that foundation. He taught at Rutgers and Howard and North Carolina Central and Delaware State. He and Belgrave were both at the Oberlin College conservatory in 2007. According to Belgrave, Byrd stuck it out in academia even though he suffered the snobbery of peers teaching European classical music. "At all these schools that he taught, he had a problem with the administration because of his approach to teaching," Belgrave said. "Because they didn't have respect for jazz." In the mid-'70s, Byrd debuted his latest evolution. He formed a band out of his students at Howard University and called them the Blackbyrds. He asked Howard alumni Larry and Fonce Mizell to work with him. The Mizell brothers had created songs for the Jackson 5, and the 1973 album Black Byrd didn't sound like hard bop or "Cristo Redentor." The album hit the R&B chart, the jazz chart and the pop chart. The Blackbyrds' subsequent albums were popular too, and Byrd became the rare jazz musician to make some real money. In fact, the story goes that when Miles Davis gave him grief for driving a Ford, Byrd replied, "That's just the car I take to my plane." Yes, he was a pilot, too. Saxophonist Gary Bartz played on some of Byrd's fusion recordings and became close with him. "We got a lot of flack for all of that," Bartz said. "You know, 'They're selling out, they're selling out.' We're not selling out. First of all, when you make a record you want to sell it." Bartz says the purists that railed against Byrd's funk-fusion sound were confused. "There are no genres," Bartz says. "There are no different types of music. You can't have different types of water. You can have dirty water, you can have clean water, you can have Perrier, you can have Evian, but when it boils down, it's water. ... It's just music." The trumpeter picked up a new generation of listeners when his work with the Blackbyrds was mined by hip-hop producers. Nicholas Payton says the Mizell brothers albums re-established his relationship with the young black community — and at just the right time. "It was hip-hop before hip-hop," Payton says. "A lot of his records were a part of the sound that, in the golden era of hip-hop, what a lot of those artists looked to, to sort of model themselves after. It was funky records from the '70s of Dr. Byrd's." Dr. Byrd welcomed hip-hop. In the '90s, he worked with rapper Guru, who used his funk-fusion recordings for the Jazzmatazz project. In an interview with JazzTimes, Donald Byrd predicted that when he was 80, he'd be hipper and mentally sharper than he was at 40. "I'll know more stuff," he said. Thanks to his constant evolution, we do too.